Call 610-933-7562 to schedule a tour or click here to request a tour online. "...a community of teachers who know your children’s strengths and weaknesses and brings out the best in them academically, socially, and emotionally..."
Welcome to Holy Family School! We are proud to be a 2016 National Blue Ribbon School and it shows. At HFS we strive to educate our students spiritually, academically, socially, and emotionally. 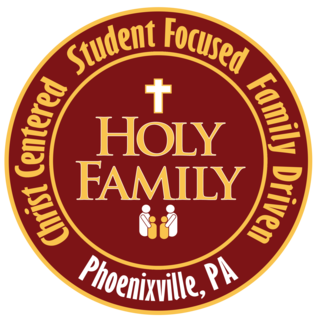 Holy Family School is Middle States Accredited and follows the curriculum guidelines of the Archdiocese of Philadelphia. Students are not only taught the core classes of Religion, Mathematics, English/Language Arts, Science, and Social Studies; in addition, they are exposed to music, art, technology, physical education, library, and STEAM. HFS also has electives and drama club for older students. Knowing and practicing our faith is a major priority at HFS. There are monthly school-wide liturgies and prayer services. We are a family of faith and proud of it. Thank you for taking some time to learn about Holy Family School. I want to extend the invitation for you to come visit us. Please contact Mrs. Corinne Martino Assistant to the Principal at office@myholyfamilyschool.org to schedule a tour.